In 1945 the Fairey Aviation Company began designing a new advanced carrier borne anti-submarine aircraft for the Royal Navy (RN). The prototype first flew in September 1949 and, following successful trials, the RN ordered the Gannet AS-1 as its new anti-submarine aircraft and the aircraft entered RN service in 1954. The Gannet was a rugged aircraft, powered by a 2,950 shp Double Mamba 100 engine powering two contra-rotating propellers on a single hub; thus giving it a single-engine profile with two-engine performance. This space-saving feature along with its kerosene-fuelled turbines, tricycle undercarriage and folding wings made the Gannet ideal for service in aircraft carriers. Its large bomb bay, wing-mounted weapons and a retractable radar dome made it a formidable ASW aircraft. The Gannet was crewed by a pilot, observer and electronic equipment operator; each had a separate cockpit with a wide arc of visibility. With a range of some 660 miles (about 995 km), and a munitions load of up to 2,850 lbs, the Gannet AS-1 was well equipped for operating over a large area, in adverse weather conditions for either day or night anti-submarine patrols. It could carry marine markers (smoke flares), directional sonar buoys, parachute flares, and in different combinations 250lb or 500lb bombs, depth charges and/or the Mk 30 acoustic torpedoes. Underwing hard-points could carried 250lb bombs or depth charges. The 16 underwing RP3 air-to-surface rockets (target dependent) used 60lb High Explosive or shaped-charge heads, and the 25lb solid steel heads or anti-submarine heads fired at 600 yards could easily penetrate a submarine hull. Despite its bulky ‘ugly duckling’ appearance the Fleet Air Arm pilots considered it pleasant to fly, with responsive controls and it was a stable weapons platform. 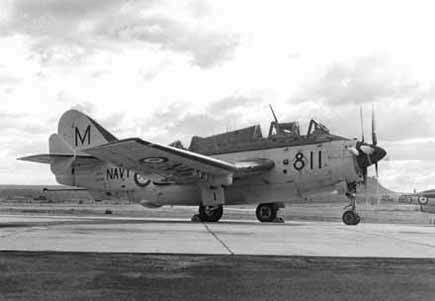 As a result the Royal Australian Navy (RAN) also decided to purchase the Fairey Gannet for use on board the soon to be commissioned aircraft carrier HMAS Melbourne. Six RAN aircrew went to the United Kingdom in early 1955 to learn to operate the Gannet at the Royal Naval Air Station at Eglinton in Northern Ireland. Two RAN Gannet squadrons were then subsequently formed at the Royal Naval Air Station at Culdrose, in Cornwall, and on 23 August 1955 they were commissioned as 816 and 817 Squadrons. On 8 March 1956 HMAS Melbourne arrived at Glasgow, Scotland where the two squadrons of Gannets (24 aircraft in all) were loaded on board (along with two squadrons of Sea Venoms and two Bristol Sycamore helicopters for RAN use). Melbourne sailed for Australia on the 12th and in early May 1956 arrived in Jervis Bay where the aircraft were disembarked and transported by road to the Naval Air Station at Nowra. Ten additional Gannets were procured in 1958 to make good losses due to accidents, however 817 Squadron was decommissioned on 18 August 1958 making 816 Squadron the sole Gannet squadron. 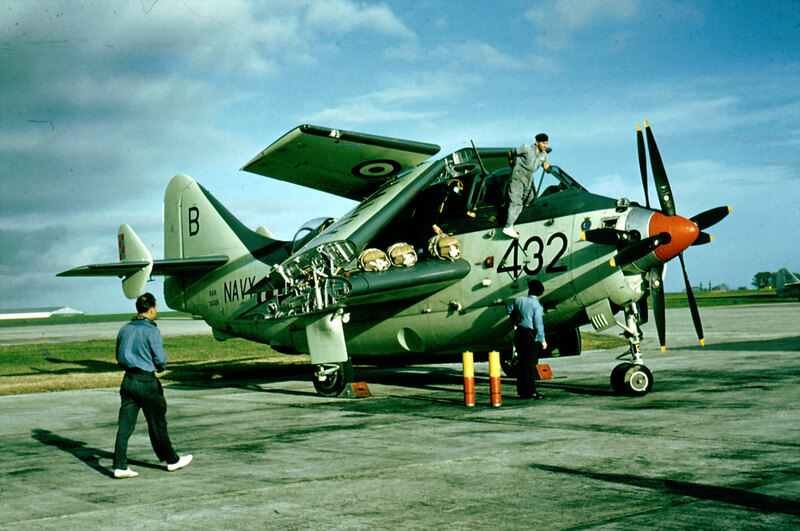 Three Gannet T2 (dual control training aircraft) were obtained in 1957 and one of the AS-1 later converted to a T5 training aircraft but they were operated by 724 and 725 Squadrons. The Gannets were regularly deployed on board Melbourne for exercises in Australian and Southeast Asian Waters as well serving as part of the Far East Strategic Reserve; where the Gannets were used for surveillance and reconnaissance duties during both the Malayan Emergency and the Indonesian Confrontation. Melbourne also escorted the fast troop transport HMAS Sydney on her first deployments to South Vietnam in 1965-66. 15 of the 37 Gannets purchased were lost in crashes and six aircrew were killed. After more than a decade of service the Fairey Gannet AS-1 was withdrawn from front line squadron service in July 1967. By then they were redundant and been replaced by the Westland Wessex helicopter with its dipping sonar and the Grumman Tracker S-2E/G with its high-tech electronics and anti-submarine equipment. A few Gannets eventually became museum aircraft but most were scrapped or used at Nowra for fire-fighting training. Left and Right: Fairey Gannet's undertaking flight training over south eastern Australia. When not embarked in the carrier training was conducted from the Naval Air Station at Nowra. 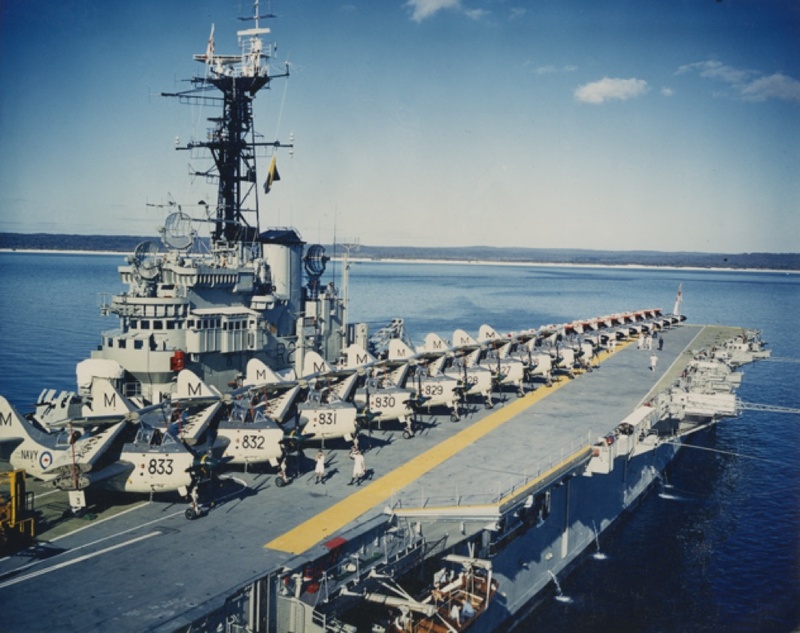 HMAS Melbourne in Jervis Bay with her flight deck filled with Fairey Gannet AS1/4 and Sea Venom fighter aircraft, early 1960's.